With Christmas just around the corner, parents and teachers are on the lookout for children’s picture books that are Christmas-related. Here is a range of brand new books, all set to delight and entertain. Macca’s Christmas Crackers is a children’s picture book written and illustrated by Matt Cosgrove and published by Koala Books (Scholastic) (2018.) RRP: $Au 17.99 HB. We met Macca the Alpaca in Alpacas with Maracas and we discovered it is the National Simultaneous Storytime book for 2019. Here is Macca in a different adventure, but again one that will get kids giggling. There’s a nice message about friendship, and how giving doesn’t need to be costly. 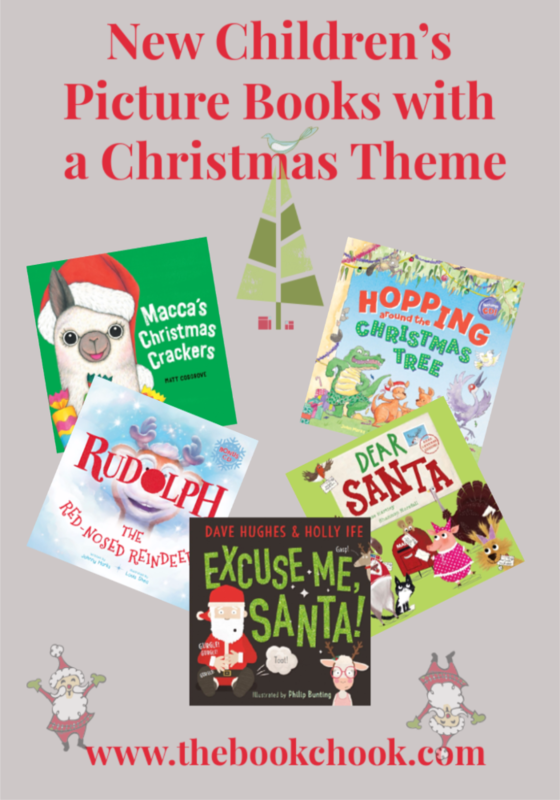 All this is woven together with brightly coloured Christmas goodies and quirky characters, making Macca’s Christmas Crackers a great choice for a read-aloud. Rudolph the Red-Nosed Reindeer is a children’s picture book written by Johnny Marks, illustrated by Louis Shea and published by Scholastic Australia (2018.) RRP: $Au 19.99 HB. Rudolph the Red-Nosed Reindeer feels different with his bright, shiny nose. But when Santa can’t fly his sleigh through the fog, can Rudolph and his shiny nose save Christmas? Here's a bright, bouncy rendition of a song so many kids will associate with Christmas. The illustrations will help little ones work out where they are in the singing, and are sure to attract all young readers with their quirkiness and fun. The book is accompanied by a CD of the Rudolph song as both an instrumental version and one sung by Penny McNamee. I love finding book and song tie-ins. Kids will already know a lot of the Rudolph song and will adore “reading” the story from their memory. Each time they listen to the song and look at the text, a few more links are made in their reading brains! A great one to recommend to teachers who want to introduce the song to a class. Excuse Me, Santa! is a children’s picture book written by Dave Hughes and Holly Ife, illustrated by Philip Bunting, and published by Scholastic (2018.) RRP: $Au17.99 HB. Martha May has marvellous manners, especially at CHRISTMAS. She writes very neat cards and gives very thoughtful gifts... and she NEVER forgets to leave yummy snacks for SANTA CLAUS and his reindeer! But what will happen when Martha May gives SANTA a GIANT PUDDING?! Find out in the EXPLOSIVE Christmas tale by Dave Hughes, Holly Ife and Philip Bunting! This is a great new contender for your Christmas resources! Building on the success of Excuse Me!, Hughes, Ife and Bunting have returned to tell us more about the well-mannered Martha May. This time she meets Santa. Unfortunately Santa suffers with an enormous windy problem when Martha May plies him with pudding. Kids will of course love the spectacular fart and likewise the double paged spread depicting it, complete with real sparkles! Perfect for junior grades with a sense of humour, and may just give kids a new perspective on Santa. Dear Santa is a children’s picture book written by Elise Hartley, illustrated by Shannon Horsfall and published by Scholastic Australia (2018.) RRP: $Au 17.99 HB. A naughty puppy, a stinky skunk, a nervous turkey and lots of other funny animals have written to Santa... and you won’t believe what they’re asking for this Christmas! Can Santa find the perfect present for everyone? Open the letters inside and find out! My students always loved The Jolly Postman or Other People’s Letters as much as I did. How exciting to open envelopes right inside the book and peek at the tiny letters within. Hartley understands how motivating this can be for kids and has created her own take on the idea. Horsfall’s illustrations complement the letters perfectly and there’s even an email for Santa! There are a range of characters with reason to contact Santa. Not so much a story as a collection of letters, it’s another interesting and very funny way of sharing the Christmas spirit, and a perfect model for a letter-writing exercise in class. Probably not suited to the rough and tumble of a library collection, it might be best kept for special supervised occasions. It also makes a cute and very different Christmas gift. Hopping Around the Christmas Tree is a children’s picture book written by Johnny Marks, illustrated by Benjamin Johnston and published by Scholastic Australia (2018.) RRP: $Au 19.99 HB. All the joeys dance and bop! Let the Christmas bells sway. And we’ll look for Santa’s sleigh! All the Aussie animals are coming for the big Christmas shindig. They’re bringing decorations for the tree and yummy food to share. Sing along to this all-new Australian version of the classic song, Rockin’ Around the Christmas Tree with the BONUS SONG performed by Colin Buchanan! Here’s another picture book which is actually song lyrics. Kids may already know Rockin’ Round the Christmas Tree song, but this version is complete with Aussie animal characters and tweaked text. The illustrations will appeal to kids - they are cheerful and cartoonish in style. It is accompanied by a CD of Hopping Around the Christmas Tree sung by Colin Buchanan as well as an instrumental version. Perfect for class sing-alongs and general Christmas spirit. If you want some more book gift ideas for Christmas, I have you covered. See The Book Chook on December 5 for a festive bibliofiesta!